This pregnancy is wrapping up fast. The, I only have a week left, kind of fast. I am just wondering when he will decide to make his big debut! I have been the biggest procrastinator getting things ready for this baby boy of mine. I finally got around to washing his clothes LAST night. As the time is drawing near to delivery, it makes me a both excited and sad all at the same time. Sad you ask? Yes, because I am one of those women that seriously LOVES being pregnant. I love feeling the baby move inside me, I love watching my tummy grow and I love the anticipation of the arrival of the new little one. I also LOVE eating and feel I can get away with it a lot more when pregnant ;) Food baby=the real baby haha! One thing I have specifically been craving this last stretch of pregnancy is lemon. Not full blown-in-your-face lemon, but desserts with a subtle hint of it. Even thinking about this recipe makes me want to hop up and go make a batch of it right this instant. Lemon Blueberry Pound Cake. It is AMAZING! It melts in your mouth and is full of refreshing delicious flavor. My family could not stop raving about it. A delicious and moist pound cake that is bursting with refreshing and amazing flavor! In a large bowl, cream butter, sugar, and lemon zest together for 3 to 5 minutes. Add dry ingredients alternatively with the buttermilk to the butter/sugar/lemon zest/egg mixture. Fold in blueberries. I guess we were both in a lemon pound cake mood this week! It is the best, especially with the blueberries! In the top part of reciepe hiw much vanilla.ut just says 1/2? I am wondering the same thing. I'm ready to run to the grocery store to grab blueberries right this minute cause this cake looks AWESOME. But how much Vanilla?? I mean you can't really go wrong if you use half a tablespoon vs half a teaspoon with most recipes! Sometimes I add extra vanilla anyway cause I love vanilla. But with it being a lemon pound cake, I'd stick with probably half a teaspoon! I live lemon and blueberries together and have been looking for a good recipe! I can't wait to make this just need to know if it is a teaspoon of vanilla or tablespoon? The up close and personal photo up there has me drooling! Just gorgeous. I had great pregnancies too (4!) so I can relate. Take care and enjoy the remaining time before baby. This is making my mouth water. That photo is beautiful! I can't wait to try it. Love this Nikki! Best of luck to you and that is so exciting! Naomi is due with our little guy on the 28th, so we are in the same mode. This looks DELICIOUS! One week? Oh how exciting. Prepare for the most exciting time of your life! That looks utterly delicious, I love the crackly glaze on top. Pinned! This s pound cake looks gorgeous! Congratulations! I know how you feel, I love(d) being pregnant too and thought I'd never want it to end. But now that I'm on bed rest and have 6wks (if we make it) to go, I'm ready for the little one to arrive. But I will miss feeling baby squirming around. Enjoy the home stretch and better yet, enjoy your little man once he gets here. The pound cake looks beautiful, by the way. This looks incredible!! My mom would just DIE if I showed up at her place with this.....that lady loves her lemon, her blueberries, and her pound cake! It's like you crawled in her brain and made her favorite thing ever. :) Pinned! Ahhh-mazing recipe! There;s something about that blueberry/lemon combo, delish! Thanks for sharing, all the hubby could say after enjoying a warm piece is "wow!" Shared the recipe! How much vanilla...there's an omission, must be a misprint. Would this do well in a bundt pan??? I have the recipe for the Lemon Blueberry Pound Cake from chief Nikki. I want to know if I could put the mixture in a bundt pan and the amount of time it would take to cook it. Thanks a million! Baking powder is a problem for me. Can you substitute baking soda If so, how much? If the taste of the batter is any indication this is going to be out of this world. The other reason I'm going to keep this recipe....it is so dang easy! So with easy and yummy....and it makes 2 loaves,-one to send to work with my wife and one for me to take to work...that's the trifecta! Working at our Vacation Bible School this evening so when we get home, make the glaze and make a LOT of people very happy. Thanks. And God's Blessings on your family. The lemon blueberry recipe has an error in it... It says 1/2 vanilla..... Do you mean 1/2 tsp of vanilla??? Did this miss the editor before it went up on your website???? Has anyone tried to use a bundt pan with this recipe? I am making it for a dinner party and thought it would look fancier. I would appreciate any feedback. This recipe is wonderful! Thanks for sharing it! This recipe is amazing! Fluffy, delicious, perfection! I see theres several with the same question I have, can a bundt pan be used? Im thinking yes. Just have to keep an eye on how long to cook it. I have made this twice in a Bundt pan, and both times it has stuck to the pan when I tried to remove it. The blueberries did sink to the bottom, so I will try it again using the suggestion to toss the blueberries with flour, and maybe leaving it sit in the pan longer than 15 minutes. It didn't matter, I just scraped the cake out of the pan and glued it all together with the glaze. I took it to a friends house, and we decided to call it "Blueberry Bob," so people wouldn't think it was a disaster! It still tasted amazing and was a big hit. I wonder how long it should be left in a bread pan? This is delicious! Question though... all the blueberries sunk to the bottom of the pans during baking. What did I do wrong that they didn't stay put and float through the whole cake?? I've seen in other recipes, to shake the bluebuerries with some flour before putting in the batter. I'm going to try that when I make this today. It looks delish! I was watching an episode of Barefoot Contessa who coated her blueberries in a little bit flour and said that prevents them from sinking to the bottom. But I followed the recipe as is and didn't have any issues with them sinking. My batter was very thick. Really loved this pound cake, couldn't wait to make it. The batter was delicious also could keep my spoon out of it. I'm not a big fan of blueberries, so used raspberries instead. So delicious!! I am from the south and our pound cakes always have way more eggs than 3. This sounds more like a bread since it is cooked in a loaf pan. Your pics look absolutely delish! l cant wait to make it! l might put more eggs in it like traditional pound cakes. l recently made a 5 flavor pound cake and it had 6 jumbo eggs in it. Anyway, it is a totally different texture than a regular cake with 3 eggs in it. It was quite heavy and everyone did love it. l am looking to making yours and feeding my blueberry lemon loving bunch this!!! thanks for posting! I made this and WOW!!! Delicious! I am going to try making this and substituting fresh huckleberries, since we just picked them recently. Any thoughts on changes I should make by doing this? More sugar maybe, or just keep everything the same? This cake was fabulous! I used a bundt pan and it worked perfectly, but you have to really grease and flour your pan. I also baked it for a longer period of time and used the extra glaze to frost the lemon cookies that are also found on this blog! Can this be made with frozen blueberries too? and is it the same amount? I have 8 lbs of frozen blueberries. I am also wondering about substituting frozen blueberries for the fresh. Can it be done while expecting the same outcome and how much? I used frozen both times I've made this recipe, but I let them thaw in a colander and allowed all liquid to drain. You can make butter milk by simply adding a tsp of vinegar to 1 cup of your milk. Let it sit a few minutes and boooom! Buttermilk! Even tho it didn't say, I added the vanilla after step 3. I used frozen blueberries, dusted with flour, which worked well. Lastly, I used a well greased/floured Bundt pan, and baked at 350° for 60 minutes. Turned out great! Did you use plain flour. ..not self-rising? Tha Lemon Blueberry Pound Cake look great. My daughter is going to make it for me today. Can I use frozen blueberries instead of fresh for the blueberry loaf recipe? Do I still use the same amount? I just want to ask. I'm from the Philippines and i'm having a hard time looking for the buttermilk. They rarely sell it in here. Is there any substitute for the buttermilk? You can mix a spoonful of white vinegar in regular milk and let it sit for a few minutes! Can I use plain flour or cake flour? I LOVE this pound cake!!! Could it be made with frozen blueberries? If so would anything need to be modified? Question...In the top part of the recipe says 1/2 tsp. vanilla and in the glaze also calls for 1/4 tsp. vanilla, but nowhere in the recipe except for the glaze does it call for the 1/2 tsp. vanilla. Should that have been included in the butter/sugar/lemon zest/egg mixture? although I agree on the taste being delicious all three times I have made this all of the blueberries end up at the bottom. I have even tried to put half in the batter and half on top just before baking. Any suggestions on how to get a better distribution of the blueberries? I will surely try your Lemon Blueberry. Pound Cake. The recipe looks easy to follow. Thank you! This cake is AMAZING!!! Whenever I make it, it goes quickly. I will be making more today. Thanks for sharing. 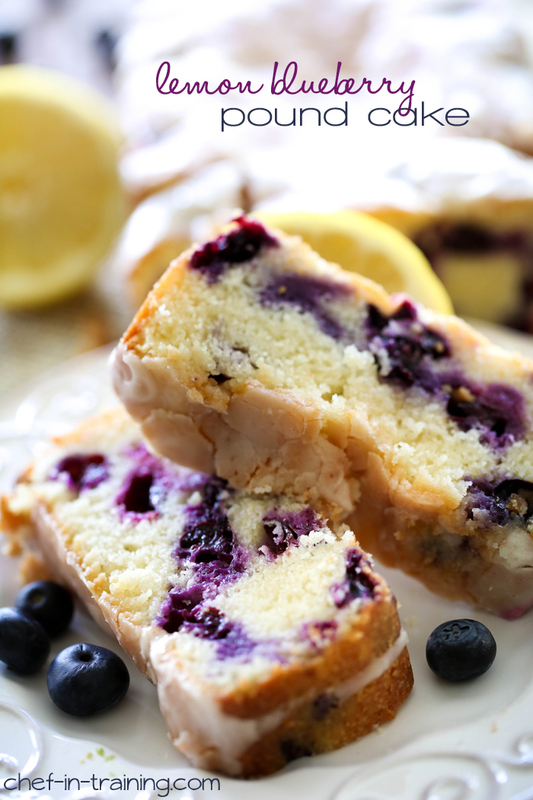 This lemon, blueberry pound cake is delicious! I made this last week and both cakes disappeared overnight! I made two more a few days later to take to a going away luncheon. Those two cakes also disappeared in the blink of an eye! I used buttermilk (and added a half teaspoon baking soda and decreased the baking powder) and also added a few pinches of edible lavender to both the batter and the icing. My lovely daughter-in-law to be asked me to make the cakes for her birthday! Any suggestions on how to modify if I just want to make 1 regular sized loaf? Not sure how to half the eggs. This is currently in the oven.. I left out the blueberries because I just really wanted to make something kinda sweet and i have no blueberries in my house at the moment. Can't wait to try it!! I made this and the middle didnt raise, Why would this happen. Tasted great though. This is simply the BEST blueberry pound cake ever. It is sinfully good. I was going to give the second one to a neighbor but my husband wouldn't hear of it. So happy that I froze so many quarts of blueberries last summer! Thank you very much for this recipe. how much is the zest of 1 lemon? This recipe soumd delicious. Would it be okay to use a bunt pan, if you dont have bread pans? I used a bundt pan for mine. I had enough batter left over that I put it in a bread pan, too. It was awesome! 9"x5" worked very well for me. Can u give me the exact size of the baking tin. I tried this recipe twice, both with frozen blueberries. I didn't wash or thaw them at all. But I dusted the buleberries with some flour and very quickly adding them to the batter. The buleberries didn't fall into the buttom of the pan. I also greased the pans really really well too. It turned out great. Delicious !! I made this on Sunday because the kids were visiting. OMG. ITS ALL GONE. The lemon and the blueberry together was amazing. Made this pound cake with my mom. It was really good. Thank you for posting! This is a favorite at my work. And it is now blueberry season. So I go to the local blueberry farm and pick A LOT of blueberries to freeze. Blueberries through the winter !!! The step to add the vanilla to the batter was omitted. love this recipe! I cooked it in a bundt cake pan and my blueberries went to the bottom, what went wrong? I've got 2 round cake pans in the oven now. I added lemon juice to milk to substitute the buttermilk. I also used mulberries off my trees, since they are in season. I bet orange juice and zest would be great w cranberries or mulberries. I also used a gluten free rice blend. This is a phenomenal recipe. Very easy to make and super delicious. I thought the batter was yummy enough but the finished product is spectacular. Thank you for a life long-keeper! This is such an awesome recipe! It's got a perfect balance of flavoring, and is great for a yummy dessert, an anytime snack or a brunch! This is a new favorite in our house! Would it be ok to substitute buttermilk for heavy cream? When do I add the vanilla, in step 2 or 3? Thank you so much for this recipe! It was a HUGE hit. My husband doesn't really care for blueberries, but he absolutely loved this. This recipe is a keeper! The pound cake itself is quite good, but I'd have liked a bit more lemon flavor in the cake [rather than the glaze] to compliment the rich buttery base. Hello can you substitute blackberries for the blueberries? This cake looks delicious. A friend saw picture of a lemon blackberry buttermilk pound cake in a magazine however but she didn't purchase magazine. I have been looking online for a recipe fitting these specifications. I may wing it and see how it turns out. Mmmm the kitchen smells wonderful as these are baking in the oven right now. I did have to use Splenda in place of the sugar, but I am sure they will still taste amazing! Thanks for the recipe! My husband and I are anticipating the first slice. This looked ssssoooo good to me that it's in my oven right this very minute, 55 mins is way too long to wait for this heavenly concoction. But it smells so good,I think it's secretly telling me to eat it now....lol. Thank you so very much for sharing and posting. I somehow skipped the vanilla because it wasn't in the directions but just in the ingredient list for the cake. Just wanted to let you know in case somebody else makes the same mistake. I am just hoping it turns out ok! Thank you for another great recipe! So delicious! I put all the batter in a bundt pan also. I made sure that I got all of the crevices with the grease and flour and the cake came out fine. However, the blueberries sunk to the bottom for me too. So next time I will toss them with flour! I loved the Lemon Blueberry Pound Cake that a friend made and she sent me the link with your recipe. It lists 1/2 teaspoon of vanilla in the ingredients but the instructions do not tell us to add the vanilla. I just added it in step #2 and I think it turned out okay. My family loves it! Would this work as an actual cake with 2 cake rounds? This cake is superb. So easy to make and so delicious. I plan to make this tomorrow for a group of 8 and was wondering ,hoping you can answer promptly ; will this work in a bundt pan? I made this for my mom's birthday and she absolutely loves it! I had reduced the sugar level to about 1/2 cup of brown sugar and another 1/2 cup of white sugar. Turned the cake slightly brownish. Did you use just white sugar for yours? i came across this recipe and decided to try it. My family and friends LOVE IT. It's super easy and comes out perfect everytime. It's a really great recipe! Are these to sit in the pan for a bit to cool & then turn out & cool completely?? Yummy ! I doubled the amount of lemon zest because I like things lemon-y ......and, since raspberries were on sale, I made this with those - cut in half and tossed in flour before adding to the batter. Thanks for a great recipe ! it is mouth watering and I will make it tomorrow! This is a great recipe, so delicious! This is a great recipe, so delicious! I love this, and make it all the time. The problem I always have is that it sinks while cooling, and almost seems undercooked. We eat it anyway (around the soft parts). I'm just not sure how to adjust the baking time/temp to get it right. Any suggestions? Made it tonight !! Wow it turned out extremely delicious !!!!! I can't stop eating it . we only got canned blueberries... will these do? I'm wondering if this can be frozen before putting on the glaze? Can't wait to try this . My two favorite flavours. It looks easy, hope it comes.out well when I try it this weekend. Thanks very much for the recipe. I threw my diet aside & had to run out & buy stuff to make this today. One of the best things I've ever made! I ate so much tonight I made myself sick. Sooooo good! WOULD A BUNDT PAN WORK TOO ? Yes I used a bundt pan and it worked great! Hi. I see that you used a bundt pan for the lemon blueberry cake. How long did you bake at 350? Lots have said they used a bundt pan but no one said for how lone... Thanks! What is a large pan, and what is a small pan? I was hoping one large pan recipe would fit in 3 mini pans. I'm hoping to 1 and half this recipe and make 9 mini loafs for a bake sale. I just made this and it's amazing!! Do you know if I need to refrigerate this after day 1? Don't want it to spoil! Thanks so much for the tasty recipes!!! can I use or add lemon extract? Baked this tonight, exactly as specified in recipe. It was TO DIE FOR!! Thank you! Great look cake! I have decided to use a bundt pan and an extra small loaf pan. It's all in the oven and looking good. I used frozen blueberries but let them thaw first and even without flouring them, they didn't sink. I think because of how thick the batter turned out. Only one problem I had is that I almost left out the extract entirely because it wasn't included in the instructions. I hope you fix that soon. For the extract I used lemon hoping it will give it a more lemon taste. I really love lemon and sometimes cakes lose the flavor after they are cooked. So here's hoping I made a good choice. Mmmm so good! I made this in a bundt pan, just make sure you grease and flour it because mine stuck a little. I also dusted the blueberries in flour and the remained in place. This is a very yummy pound cake! The only thing missing is some vanilla bean ice cream! I have this cake in the oven right now, can't wait to try it!! I have made this cake a few times now and it's a super hit with my friends and family! It is perfectly moist with a sweet and tangy taste of the blueberries and lemon. The lemon glaze just tops it off! This was absolutely the best pound cake I've ever tasted. Add in the lemon/blueberry flavors and it is over-the-top good! After making it to use up some blueberries and thinking I'd be the only one who liked it, I was surprised to hear my daughter asking me to make her some more. This recipe will be at the top of my cake list from now on!! Just popped this in the oven! The batter was delicious on its own so I can't wait to taste it when it's done. I'm looking to find how many calories per serving with this recipe. Used 3 cups of rice flower, 3.5 cups regular flower for two batches. This is a fabulous recipe, you won't be disappointed!! Does it freeze well, and if I freeze it, should I leave the glaze off? This looks moist and delicious I can't wait to make it. I have a question about the size of the pans can you please say the dimensions because I have many and what I call large or small you may not. Thank you so much! I just made this for a school fundraiser. They turned out awesome! I followed the recipe exactly but made mini loaves (1-3/4 c size aluminum pan). One recipe made 7 loaves, maybe could have been 6 but I didn't want to have them run over the pan. It took 45 minutes for the mini loaves. I did use frozen blueberries because the berries are expensive here right now so that might have affected the cooking time. I will absolutely make this again! I make wedding cakes and I've been looking for a lemon blueberry cake to add to my flavors. What I love about this cake is that is light and not at all heavy like a pound cake. The batter is thick and I did use frozen berries but when it baked up it was so light just like my other butter cakes. I made it in three 6" round cake pans plus a 6" square pan. I was surprised at how high it baked up...it was lovely. I did squeeze into the batter the juice of 1/2 of a large lemon and replaced the vanilla extract with lemon oil but once baked it did not have a lemony enough flavor for me so that's why I'm giving it only 4 stars. Maybe I will try tweaking it more to get more of a lemony flavor but other than that it was delicious! Love this cake but I routinely have a problem with the glaze. It gets firm so fast that it's difficult to glaze the cake. I've been putting it in the microwave to loosen it up but wondering if I'm doing something wrong. I've used both a whisk and a spoon to mix the glaze ingredients. The glaze recipe calls for 1 1/2 C of powdered sugar. Is this correct? thanks! Can I make this without using lemon zest? Is there a substitute for lemon zest? Will it taste differently if I don't use the lemon zest? Can I use clementines zest? Thanks. Could you please tell me what type of suger is used- powered or granulated. I just made this and I hope it turns out as pretty as the picture but I will say the batter looked promising and smelled wonderful ! Can you cook this in a Bundy pan instead of loaf pans? Made this and it was absolutely delicious!! But I think I either over mixed or under mixed batter because each loaf was only about 2 inches high. I used 2 9x5 pans. Can anybody advise me if that is how it is supposed to turn out? I want to make it again for a party but need your help first .Please respond. I made this and it caved in the middle? But it still taste great!!!! Great recipe! We added raspberries and blueberries. Yum!! Definitely be making it again and again. I made this today, and it is amazing! Light, sweet and tart!! Delicious! A spring time must! Help! I LOVE this but my brother may have Celiac and needs Gluten free flour! Can you give me suggestions to pull this off & be delicious? I made this delicious cake last Easter. I made it in a loaf pan. It was very pretty on display. It tastes of spring !!!! Everyone loved it -- sent everyone home with a slice for breakfast. Getting ready to make another this Easter. Thanks for the delicious recipe. Hi--I just made your recipe, the whole house smells wonderful! I've not tasted it yet, but I was disappointed my loaves probably fell due to my altitude. we live at 7000 ft (near Colorado Springs and I came from sea level). I was hoping you or another reader may have some suggestions to help loaves rise in the middle. Thanks for your wonderful recipe! This is by far the BEST Lemon Blueberry Pound Cake I've ever come across! Make it all the time and share the recipe a lot. Thank you! This looks incredible! I want to make this for an event on Friday. Can I make it Thursday night and add the glaze Friday morning? Has anyone made it a day ahead of time? Can you use a Bundt or tube pan instead and if so, how long and at what temp? I made this tonight using a bundt pan and wish I'd read the comments first. All my blueberries sank to the bottom and it turned to mush basically. The top 2/3 of the cake set up great though, and after finagling the the blueberry mush out and put it on top and glazed everything. The taste was great and everyone loved it. I will make this again for sure, when I do I'll cut the amount of blueberries by 1/3 and roll them in flour. Hopefully that will help!! I have made this recipe MANY times since coming across it last year. Everyone loves it, it's super simple. I've used frozen and fresh blueberries and it always comes out delish...just melts in your mouth! Thanks for sharing! Could raspberries be substituted for blueberries? I never leave comments, but have made this several times and it is AMAZING! I make six mini loaves to ensure the middle bakes enough. Everyone who has eaten it LOVES it and asks for the recipe. I made this yesterday. It is fantastic! Easy to make. I love lemon and blueberry!